After many excursions to the past, to the future, and to distant planets, Doctor Who returns to modern-day Earth with an offering that feels like an homage to the Russell T Davies era complete with a sinister global threat that slowly builds as the episode progresses, newscasters explaining the global reaction to and ramifications of the threat, and even some further exploration of the Doctor as well as Amy and Rory. The multitude of very ordinary cubes forms the ominous focus of this episode, a very slow invasion force that initially captures the world’s interest before becoming commonplace paperweights and junk due to their apparent meaninglessness over several months. It’s not until they’ve been accepted as a normal item that their threat is eventually revealed. As events slowly played out over the course of almost a year, it helped to portray the sense of just how long the cubes are present before doing anything interesting. And as Amy warns that the world is taking them for granted sure enough a countdown appears on the faces of each and every one. The return of UNIT to help reinforce the global security concern is a welcome touch, and Jemma Redgrave makes a powerful first impression as the leader, proudly carrying on the Lethbridge-Stewart lineage. 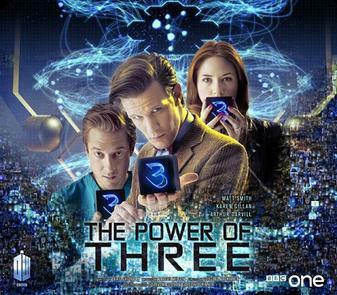 The big issue with ‘The Power of Three’ is that is slightly too ambitious and tries to fit too much into its running time. Aside from the fantastic slow-burning buildup of the cubes, this story also wonderfully focuses heavily on the Doctor and the changing lives of Amy and Rory. As a result, the conclusion of the piece feels rather rushed and almost as if several minutes of events had been excised for time. Steven Berkoff is properly menacing as the Shakri, and the connection to Gallifrey and the Doctor’s disbelief certainly warranted a more thorough exploration. As it is, though, the confrontation that seems so inevitable instead boils down essentially to a hasty and ultimately disappointing debate about human nature. The course of the year as the cubes are watched and studied is spent primarily in Amy and Rory’s home, giving a unique insight into what the companions’ lives are when not with the Doctor. As the Doctor’s visits have become more infrequent over- for them, at least- nearly a decade, the more domestic lifestyle with real jobs, friends, and family has started appealing to them more. It’s no secret that the two are leaving the show soon, and so it’s nice to see the pieces being put in place rather than having them hastily leave as some other companions have in the past. As in ‘Dinosaurs on a Spaceship,’ though, it’s Rory’s father Mark that steals the limelight, first as he humorously dedicates himself to completing his assigned task of watching and logging his cube’s actions and then later as he realises the dangers of traveling with the Doctor and simply asks him to bring Amy and Rory back safe. That request brings with it a lingering ominous undertone and certainly keeps anticipation for what is eventually bound to be an emotional departure scene high. This extended time in one place again allows Matt Smith to show off the full range of his acting abilities. The Doctor proved in ‘The Lodger’ that he’s not very good at living an ordinary life, and the threshold of his patience with mundane activities is hilariously short. Yet as events continue to unfold, that humour and frustration out of boredom leads to some very poignant moments as well as some very tense and terrifying ones, and Smith once again proves the caliber of his skills by rising to the occasion in each and every scene. ‘The Power of Three’ is another enjoyable episode in this run even if the ‘fix’ of the cubes’ effect on humanity is quite convenient, but sights are squarely set on the Weeping Angels’ return in the next story. Even though this featured a truly global threat and marked the welcome return of UNIT to screens, the scale of the episode seems much smaller than its predecessors in this series. This is no mark against the story, though, as the setting and slow buildup allows for many great character moments and aptly sets events and mindsets in motion for Amy and Rory’s impending departure.